Lobster Gram is a lobster delivery service that has been in the business of delivering live lobster dinners since 1987. Over the decades, lobsters have remained the central part of its offer, but the service now features much more than premium-quality live Maine lobster. Its selection includes various kinds of seafood, meat, side dishes, and desserts. Plenty of neat special occasion packages are available as well. If you wish to enjoy a one-of-a-kind, lobster-packed home dining experience, this Lobster Gram review may just hold a perfectly luxurious answer to your cravings. In order to shop at Lobster Gram, you do not need a subscription. You can stop by its online shop at any time, pick the items that suit your taste, and have them delivered within a day or two. It is simple, convenient, and there is no minimum order. 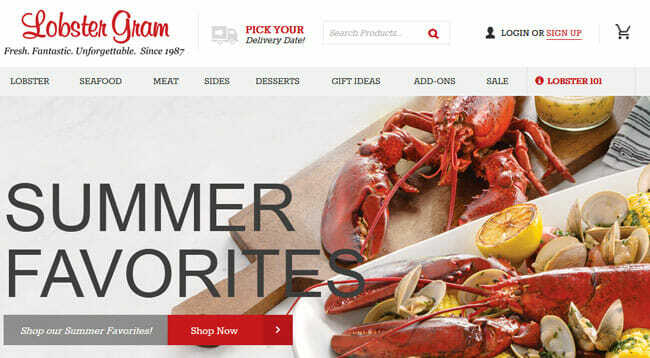 Lobster Gram has dozens upon dozens of products in its offer. You can purchase lobsters, meat, seafood, side dishes, and desserts individually or you can opt for lobster dinner packages suitable for a variety of occasions, from romantic Valentine’s Day dinners to Thanksgiving feasts. 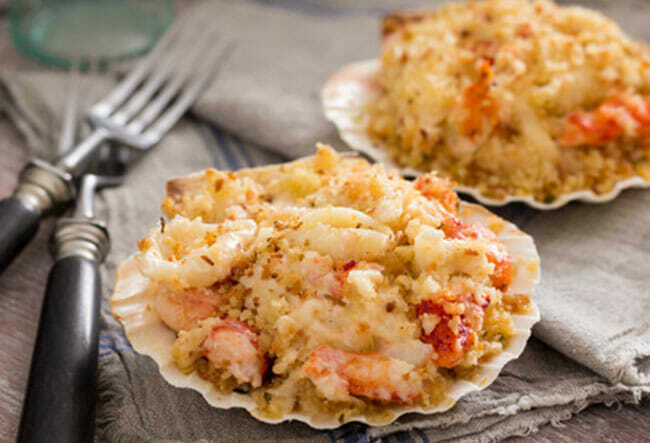 All sides and desserts are pre-made, but you are in charge of preparing the lobsters, seafood, and meat by following the instructions provided in the Lobster Gram cooking guide. Since the company aims to provide unforgettable dining experiences, it does not limit your choice to pre-made packages but offers to create custom packages for you as well. Furthermore, all of its products come with a happiness guarantee, so if you are not completely satisfied, you can get in touch with the customer support within a day after you receive your order and the friendly staff will do everything possible to make it right. Lobster Gram’s long tradition and dedication to quality and freshness make it one of the top delivery services of its kind in America and beyond. It is rated 4.8 stars in Google Trusted Stores and it is nearly universally praised for the quality of its products and customer service. It has been featured on The Wheel Of Fortune, Oprah, Rachel Ray, Wall Street Journal, Men’s Health, and a variety of other popular programs and publications. As a regular customer, you get to enjoy the best prices all year long with zero fluctuations, frequent discounts, and the extraordinary flavor and texture of freshly fished Maine lobsters that are guaranteed to arrive at your doorstep alive. In order to maximize your pleasure, the company provides various add-ons and lets you order both fresh and frozen seafood, depending on when you plan to cook your feast. You can enjoy the world-famous live Maine lobsters or opt for exotic tails from around the world. It is completely up to you. The range of gift options available is quite impressive. While you can opt for carefully designed holiday and special occasion gift baskets, you can also play it safe with email and physical gift cards. You can opt for gift cards with a custom value between $25 and $500, Create-A-Gram cards that let the recipient create a custom 4-course lobster feast, and Your Choice gift certificates that let the recipient choose from 4 items valued at $135 to $185. The company does not only offer personal gifts but also provides great corporate gift options. Lobster Gram’s selection is divided into 5 sections, helping you quickly find what you are craving. 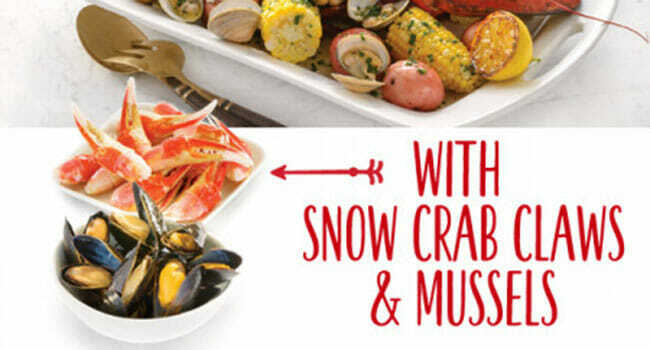 The sections include Lobster, Seafood, Meat, Sides, Desserts, and Add-Ons. In the Lobster category, you can find live lobsters and lobster tails available for individual purchase, live lobster dinners, lobster tail dinners, surf & turf packages, lobster meat dinners, and lobster meat & rolls packages. All dinners come with fresh, ready-to-cook lobsters and other seafood or meat and ready-to-heat side dishes and desserts. You can opt for dinners suitable for 1, 2 or as many as 10 people. If you want to enrich your dinner with more delicious seafood, in the Seafood section you can find top-quality crab, shrimp, scallops, clams, and mussels. You can purchase fresh seafood individually or in assorted packages and you can always pick up a couple of pre-made seafood sides. The company’s meat selection is limited to meat that goes well with lobster, including steaks and burgers. From New York strip steak to filet mignon, you can find all the premium cuts that can make your lobster dinner even more satisfying. The Sides section features soups and chowders, seafood cakes, sides and appetizers, and unsalted Butter and sauces. You can purchase sides individually or opt for samplers that usually include 3 to 4 different sides. If you are in the mood for dessert, you can opt for full cakes and pies that you can share with family and friends or order single-serving desserts. Usually, you can choose from a range of cheesecakes, such as Maine blueberry swirl and New York cheesecake, chocolate cakes, key lime pie, and single-serving lava cakes and whoopie chocolate pies. Finally, if you have already picked out a dinner but wish to customize it and add something extra to your feast, you can visit the Add-On section. There you can pick up more lobsters, lobster tails, seafood, steaks, sauces, sides, desserts, and even accessories, such as professional lobster sheers. Along with the food, you get a complete beginner-friendly cooking guide in your order, so you can learn how to perfectly cook a lobster and prepare an unforgettable gourmet dinner. The price of your lobster dinner depends on the type of dinner you choose, the presence of add-ons, and the number of people you are cooking for. For example, a live lobster dinner for 1 costs $105 while the colossal lobster tail feast for 4 people costs $395. Live lobsters start at $90 per lb. The sides generally cost around $10 per serving and the desserts start at $25. Since you can order everything individually, you can create a custom package on your own and build an order that fits your budget. Shipping is not free. The shipping fee depends on the value of the order and the selected shipment method. For orders worth up to $299, shipping fees range from $30 to $78 (higher order values result in higher shipping fees). For orders over $299, the shipping costs amount to 15% of order value. Lobster Gram ships its products throughout the US, including Hawaii and Alaska. However, it is important to know that state laws prevent Lobster Gram from delivering Maine lobster tails and Maine lobster claws to addresses in Massachusetts and New Hampshire. Residents of these 2 states can instead order exotic lobster tails from Brazil, New Zealand, Australia, South Africa, and the islands of Tristan Da Cunha in the South Atlantic. All orders are shipped via UPS. Available delivery days include Tuesday, Wednesday, Thursday, Friday, and Saturday. Shipping options include 2-day delivery, overnight delivery, priority overnight delivery, and Saturday delivery. Packages are only delivered to street addresses. PO box delivery is exclusively available for physical gift cards. If you live in an apartment building, it may be necessary for you to be at home to receive your delivery. To make sure Lobster Gram meets all your standards and expectations, it is important to know its biggest advantages and disadvantages. With a short overview of its pros and cons, you can easily decide if Lobster Gram is the right company for you. If you are a lobster lover, Lobster Gram is a delivery service that you do not want to miss. The prices are not low, but they are certainly justified by the quality. There are more options than you can try out in a year, with plenty of room for order customization. Whether you are building your package yourself or want to try out one of the pre-designed dinners with optional add-ons, you are sure to enjoy the ultimate lobster feast. Our ratings are the result of an objective and independent evaluation of Lobster Gram, generating the final rating that reflects the overall quality of the company. Ratings may change as the service changes. Lobster Gram customer rating based on 3 customer reviews. I love lobster dishes of all sorts but I always thought they were too complicated to cook on my own, plus, finding lobster that is actually fresh can be pretty hard where I live. I order from Lobster Gram at least once every 2 months and I've actually learned how to properly cook a lobster myself, which is a big deal for me, because I'm pretty picky and I don't always like the lobster dinners I get at restaurants. Lobster Gram never disappoints! My husband goes away on business a lot and it has become a sort of a tradition to order a dinner from LG when he comes back. Never have we received anything that wasn't perfect. We found 1 verified Lobster Gram discount for April, 2019.